Each Cremins Moiselle collection represents the perfect union of aesthetic and quality, hand-selected to meet the requirements of our clients who value superior quality and sophisticated taste. The high demands we place on the luxurious materials we source have earned us the reputation of being Ireland’s premier supplier of high-end fabrics to fabric professionals, specifiers and interior designers. Each range tells its own story, from the traditional to the contemporary. And each represents the culmination of a voyage of discovery through texture, colour and pattern. They all speak with distinct voices – they speak of opulence or of serenity, of instant allure or of subtle charm, of luscious silks or of cool linen. These voices become an extension of your own and share the vision of personality for your space. Each year, the Cremins Moiselle collections are launched in the Spring to an audience of fabric professionals and interior designers through a series of events throughout Ireland. 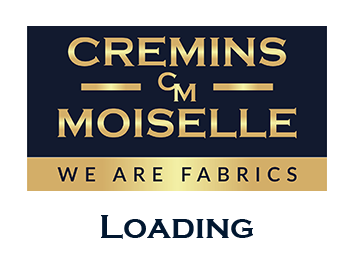 1983 Founded by Gerard Cremins and Louis Moiselle, Cremins Moiselle is launched as a retailer of fabrics in Dublin, Ireland. 1994 Cremins Moiselle distributes its first collections of fabric brands to the trade. 1998 In April and September, Cremins Moiselle launches the first of its design events in Dublin. 1999 The company presents its first Spring Road Shows to launch its new collection, a tradition that has continued every year since. 2000 The fabric brand Cremins Moiselle is launched. 2001 Christian Fischbacher delivers his first of a series of design presentations in Ireland at the Cremins Moiselle showroom. 2004 To mark the company’s 21st anniversary, Cremins Moiselle moves to a custom-designed building in Bray, Co. Wicklow which becomes the national showroom as well as being the administrative and logistics base. 2006 Cremins Moiselle is presented with the coveted Robert Allen Distributor Showroom of the Year Award 2006 at the Robert Allen group sales conference in New York. 2007 Cremins Moiselle presents the groundbreaking “Tell the Story, Share the vision, Create something beautiful” design show, to the acclaim of the many interior designers and specifiers who attend. 2008 Christian Fischbacher gives special address to an invited audience to celebrate 25 years of Cremins Moiselle. 2009 Eijffinger Wallcoverings are launched at the Spring Road Shows. 2011 Cremins Moiselle presents Jacaranda. 2012 Cremins Moiselle launches Fabricut in Ireland. 2013 David Finer, CEO of Fabricut, is the keynote speaker at a special event to mark 30 years of Cremins Moiselle. 2014 Cremins Moiselle awarded Fabricut Partner of the year 2013/2014 and begins its collaboration with York Wallcovering. At the heart of Cremins Moiselle is a passion – a passion for relationships. The relationship we have with our fabrics, the relationship we have with our clients and the relationship our clients develop with the quality, design and dependability that we offer. A family-based company, Cremins Moiselle was founded on the premise of bringing the highest standards of fabric to the discerning client with whom we shape aesthetic enviroments. Our passion lies in sourcing the highest quality materials, the most inspirational textures, colours and patterns and presenting them to you with the total conviction of unsurpassable timeless elegance. We work with you to bring out the character of the spaces we create – spaces that speak with personality and emotion. We carry our passion through the relationship we forge with you – the service we offer, the range we offer and a level of sensory satisfaction that will surpass your highest expectations. We know you feel passionately about your choices. Share in our passion and together we will create something beautiful.